Our current issue takes a look at Haiti two years after the 2010 earthquake. This month, our Radio NI podcast features a special round table discussion in partnership with the Haiti Support Group, a leading international advocacy group for Haiti based in London, who have been fighting for the rights of the Haitian People for many years, and will continue to do so. 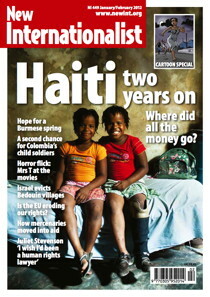 Part one of this discussion centred around Haiti's troubled history, as discussed by Phillip Wearne in the magazine. This concluding episode turns to the problems facing today, and the solutions available. Participating in the discussion are Mario Joseph, Haiti’s leading civil and human rights lawyer, and Anne McConnell, coordinator of the Haiti Support Group, and Phillip Waerne, also of the Haiti Support Group. They talked with our podcast editor Nyan Storey.